The newly rebuilt and enlarged apartments at Burvel suit especially those who are in search of the Alpine cosiness and comfort. Our apartment "Cunfolia" lies on the ground floor for 2-4 people and is composed of a spacious double bedroom as well as a children’s room equipped with a bunk bed. There is an eat-in kitchen with lounge, refrigerator, toaster, coffee machine, microwave oven and a dish washer. 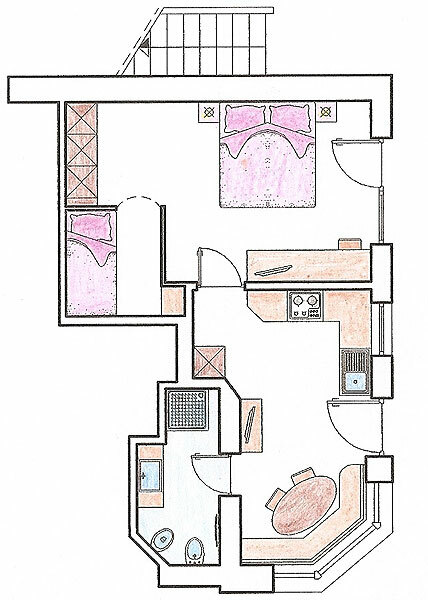 Further there is a bathroom en suite endowed with shower, lavatory, bidet and hair dryer. Bed linen and bath towels, satellite television, telephone, broadband internet connection, fridge, coffee machine, toaster, microwave oven, dishwasher and a safe are included. We charge a small fee for using the garage and the washing machine. The private parking lot is free of charge. The rent includes a ski room with boots-dryer, lawn for sunbathing as well as table tennis in summer. We allow dogs only in summer under the condition that they are not left alone in the apartment.